I bought a new camera today for wide angle pictures. My current camera doesn't shoot wide enough for me to get an entire small room. Of course, like any kid with a new toy, I've been playing around with it. I can now shoot the height and width of a room without cutting off areas. I was actually quite impressed with the ability to get an entire room in the photo without distortion. Of course you can see things that are out of place and wouldn't be in a picture online of one of my listings. Photos are like wearing black pants. Every bit of lint, hair or dust shows up on black pants. You just can't hide it. Same thing with photos. Every out of place item shows up. 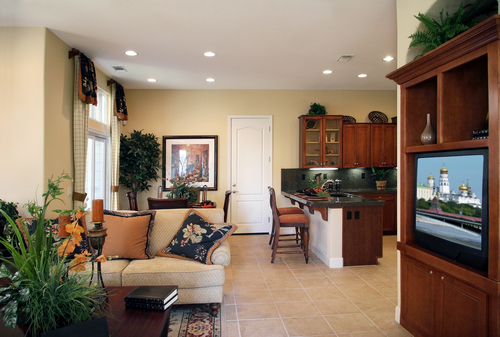 Photos of homes on the MLS need to be light bright and clutter free. Walking through my kitchen and living there, I don't notice the photos on the fridge my grand children made for me or the countertop with a few too many *things* out of place. I don't mind that the ironing board is always up or the fact the towels aren't hung straight on the towel bar. Even if I don't mind, the camera knows and picks up every little thing, just like those darn black pants. Now I have a 'to do' list for my house. As I looked at my pictures, I thought about the times I have sold my own home and relate to home sellers who have their home on the market. They know they could get a call at anytime for a showing. It's hurry up and get the home 'picture perfect' in time for a showing. When we take pictures for the MLS, we always take the best shots we can, hopefully with everything in it's place. When home owners are selling their home, it's almost like living every day as if no one really lives in the home. You want to make sure everything is in it's place, just like the pictures submitted online. If everything else is in line with the marketing of your home, it shouldn't take too long and you can get back to living life, as normal.....with a few things out of place. I love my wide angle lens, but one thing I learned (just giving some unsolicited shooting advice) is that my wide angle pictures look the best if I only show 2 walls in the picture. When you show all of a 3rd wall in one shot, it almost always has that long narrow look. Just my opinion, hope that helps! Michael - thanks for the advice. I've had some time to practice a bit more and you are correct. You really have to take at an angle to avoid the long room affect.